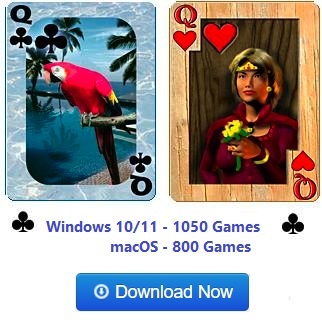 Click on the screen shot of the game Quadruple Klondike from Pretty Good Solitaire to download the 30 day free trial version. 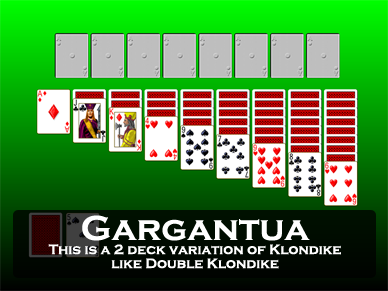 Quadruple Klondike is a four deck variation of the classic 7 pile game Klondike. My version of Quadruple Klondike in Pretty Good Solitaire allows you to play offline, full screen, with complete undo and my unique right click quick move. It's the best way to play solitaire! There are 16 foundation piles for the four decks, which are to be built up in suit from Ace to King. The object of the game is to move all of the cards to the foundation piles. There are 16 tableau piles. At the start of the game 1 card is dealt to the first pile, 2 to the 2nd pile, and so on to the 16th pile. The top card is face up. The remainder of the cards for a stock, which will be turned over 3 cards at a time by clicking to a waste pile. The top card of the waste pile is available for play on the foundations or tableau. In the tableau, building is down by alternate color as in Klondike. Groups of cards may be moved as a unit if they are in sequence down by alternate color. Spaces may be filled by a King or a group of cards headed by a King. 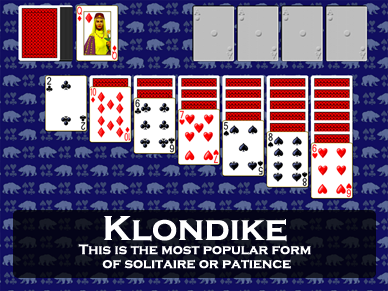 Quadruple Klondike is easy to play if you know Klondike, and it is fairly easy to win. With four decks there are a lot of cards and a game takes much longer than regular Klondike.